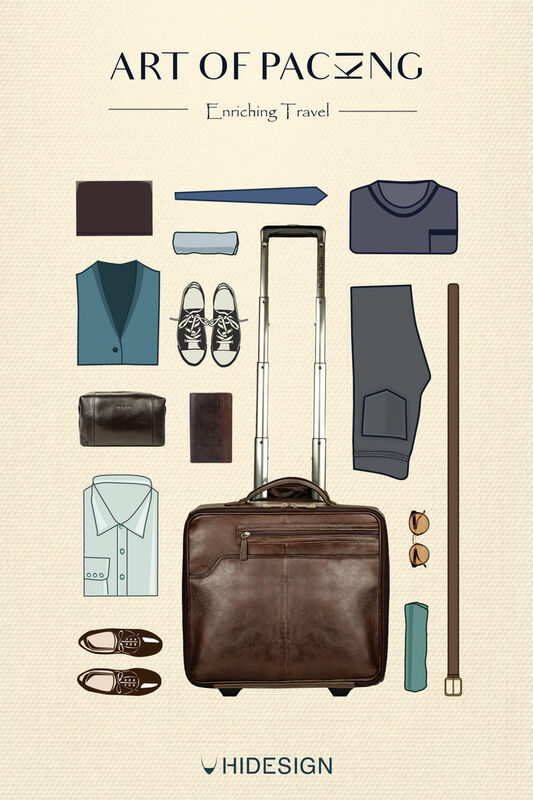 Art of Packing features a collection of well-designed travel accessories for men and women that range from the cabin size 4 wheeled spinner luggages like the Ridgeway, Ettore and Jackson to the smaller yet spacious 4 wheeled brief with laptop cases such as Sundown & Roma which are inspired by urban and business travelers. These bags have been hand crafted at the Hidesign factory in India keeping in mind the needs of the Hidesign customers using clean lines and well-designed interiors and compartments. An all use Duffle Bag is a perfect companion for hitting the gym or an impulse getaway holiday on the weekend and we have an array of selections such as the classic Roberto, the fun Borjigin and and classic Safari. The washbags such as Tashi and Nicholson have interiors fully lined and feature a zipped main compartment offering ample room for toiletries. Overnighters such as the Corvette & Sundown are a must have for those quick last minute overnight work/leisure trips. Backpacks such as the Tuareg, Quebracho and Viking can stow all your smalls and travel essentials and make it a fun travel accessory. The Art of Packing combines Hidesign’s travel line into a striking coherent collection with pieces which can be matched across the range.